A choice of six stunning vibrant coloured floral umbrellas! 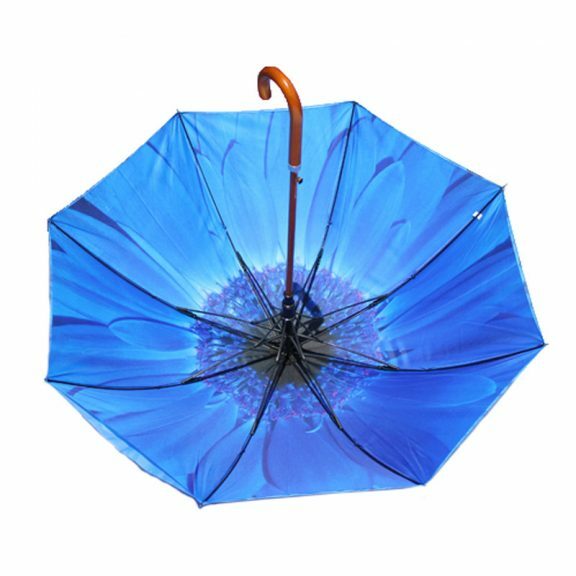 These fantastic blue flower umbrellas are sure to spruce up your day, no matter what the season! Introducing this beautiful blue flower umbrella from our brand new Double Canopy / Auto Open Flower Umbrella range. 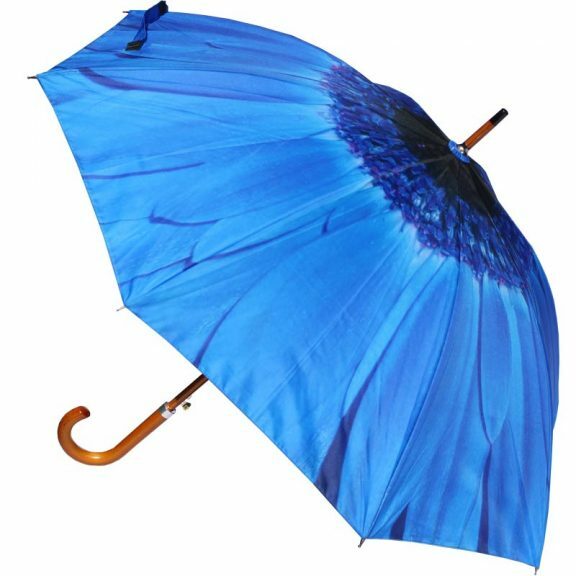 This exclusive and extravagant blue flower umbrella will spring into life at the push of a button. Also, this brolly features a distinctive black / gold auto-open button. These wonderful walking style flower umbrellas have a polished wooden crook handle. Holding one of these bold blue flower parasols feels comfortable and effortless! 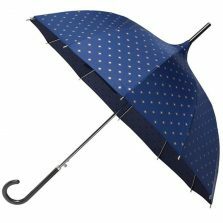 These sensational windproof blue brollies have an 8 panelled double canopy, supported by flexible fibreglass, cantilever action, individually sprung ribs. These really are some “blooming” quality flower umbrellas that you’ll only find here! 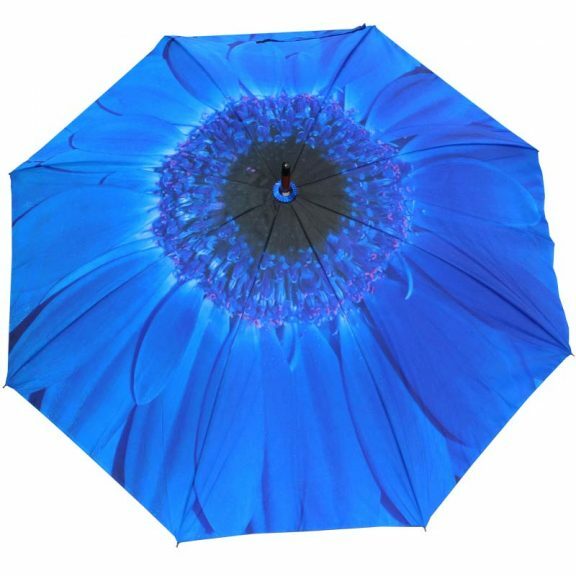 This cool blue floral umbrella has a double canopy. Also, the flower print looks just as pretty from the underside as from the outside. Many other floral brollies on the market have a single canopy. Printed on the outside only giving a slightly faded looking underside. Remember, say it with flowers! Flower umbrellas make beautiful fashionable yet practical gifts. 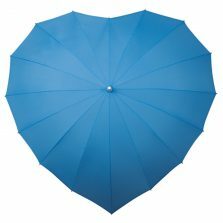 A truly beautiful umbrella to pose with, perhaps matching that new blue outfit at some forthcoming special event? Something borrowed, something blue? Just “planting” the seed of an idea. 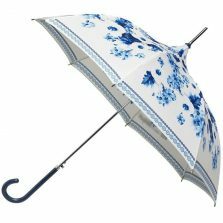 Actually, these blue floral umbrellas are so blooming beautiful you’ll be waiting for the next rainy day to use them. No matter what the occasion. Other colours in the range include, red, orange, yellow, pink and purple. Our blue not the right one for you? Check out the rest of our flower umbrellas!